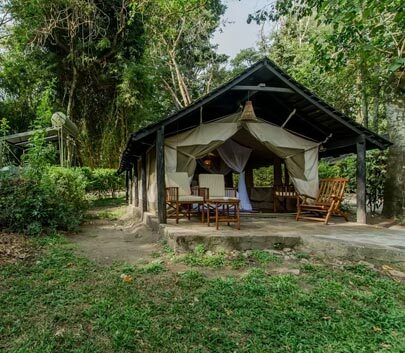 Sarova Mara Game Camp is located within the world famous Masai Mara Game Reserve, where its 75 tents capture the true spirit of the Kenyan wild. Your accommodation for the next two nights will be in one of the Mara's luxury tented lodges, allowing you to experience your nights "in the bush" with all of the comforts of home. MARA SAROVA TENTED CAMP is situated on a natural elevation between two streams and is set amidst gardens full of exotic flowers. Each luxury canvas tent, has a permanent roof and floor and attached en-suite bathroom including a flush toilet, sink and hot showers. 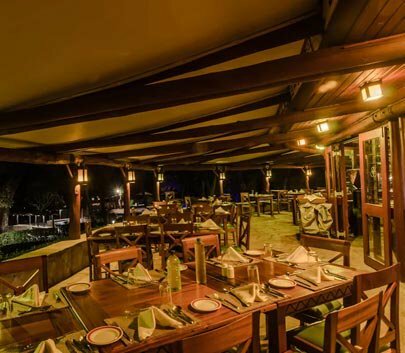 Meals are served in the spectacular thatched roof dining room. The rolling plains around the tented Camp are teeming with wildebeest, gazelles and zebras, during the migration months and the Camp is situated right in the center of their migration path. Sarova Mara Game Camp is also the ideal choice for those seeking a richer experience of Masai Mara that goes much beyond just game drives. By virtue of its location and layout, the Camp offers an unparalleled plethora of activities and experiences from luxury tented living to bird-watching, mini golf, sport fishing and a unique insight into the Maasai culture at the adjoining Maasai village. Pick from your Hotel or JKIA and transferred to Wilson Airport for the scheduled flight to the world famous Masai Mara Game (Wildlife) Reserve. The Mara is actually the northern portion of the great ecosystem in neighboring Tanzania called the Serengeti. It is the home of the "big five" - loin, leopard, buffalo, rhino and elephant as well as cheetah, zebra, giraffe and vast herds of plains antelope and numerous other wildlife. -Two nights Accommodation in stardard tents on full board basis. - Transfer to Wison airport from a city hotel or JKIA.